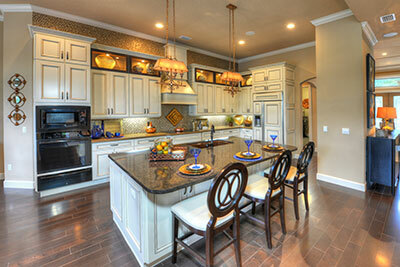 ICI Homes offers an extensive portfolio of more than 100 home floor plans ranging from 1,240 to 4,200 square feet. Each home floor plan is designed to accommodate some "made-to-order" optional spaces that are so frequently requested they finally have become part of a set of more than 30 choices that you can easily add to your base plan. Bonus Room: Among the most popular custom home options are bonus rooms, usually built into the roof trusses or over the garage adding a second floor space of 400-500 square feet that can be used for a variety of functions. It may be the extra play room for the kids, a teenage hideout, a study or an exercise room. Add a wet bar, and you have a rumpus room or a home theatre room. Add a full bath and it becomes an extra bedroom or private guest suite for occasional company from "up north." Pool Bath: Another popular Florida option is a cabana bath, which turns a downstairs bathroom into a pool bathroom with doors at each end, allowing wet feet access to the inside and avoiding the drip-drip-drip across the living room floor. Summer Kitchen: Because entertaining on your patio or courtyard is so popular, another wildly popular custom home add-on is the Florida summer kitchen, where you can prepare, cook and store food outside, just a few steps from the action, making casual entertaining a joy. To make this space even more appealing, consider adding some extra pavers, a fountain, a screened room or a solar-heated pool and Jacuzzi. The list is endless. Flex Spaces: Interchangeable bedroom/study combinations can flex a room to suite your individual needs and hobbies. Butler pantries and wine rooms for the gourmet cook, golf cart garages, man-caves, mother-in-law suites, lofts, balconies and decks are all in the mix. So if you really like a home plan the way it is and just need to tweak it, chances are that thousands of buyers before you had the same idea and forged the path. So look to the long list of tried and true optional spaces that ICI Homes has collected over the years and consider adding a thing or two that will make your home uniquely yours.